In 1948 Fr. William Voors began preparation for what was to become St. Jude Parish. In June of 1948, Bishop Pursley commissioned Fr. Voors to formally start a study regarding a new Parish in the south end of town. 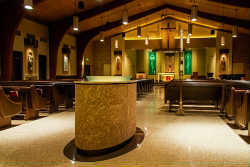 On December 5, 1948, in the Southmore Community Building, the first Mass was celebrated with what was to be the founding community of the new Parish. In July, 1949, Fr. John J. Szot was assigned as the first Pastor. The Parish began with 110 registered families. In December 1949, a parcel of land consisting of thirteen lots (bounded by Hildebrand Street, St. Joseph Street, and Johnson Road) was purchased. And then the wheels kept in motion. In the spring of 1950, a tentative sketch of a combination School and Hall, which would serve as a temporary Church, was drawn up by Mr. Howard Pletcher and approved by Bishop Pursley. A groundbreaking ceremony was held on the Feast of the Assumption, August 15, 1950. In the construction of the new building, lumber and other materials were salvaged from the Chapel donated by the Franciscan Sisters of Mount Alverno. The chapel was dismantled by the men of the Parish and was used in our new construction. This was indeed a huge savings for the new Parish. The cornerstone was blessed October 29, 1950, on the Feast of Christ the King and sealed November 1, 1950, on the Feast of All Saints. In March 1951, as construction was nearing completion, a residence on Johnson Road was provided for the Pastor. It was fittingly Fr. Szot’s privilege to offer the first Mass in the new Church on April 22, 1951. The dedication of the new Church was held on June 10, 1951. By October 1953, a residence adjacent to the Church and Parish property was remodeled to serve as a Rectory. The new Parish community grew rapidly in numbers. Another groundbreaking ceremony saw the beginnings of the Parish School. This was April 8, 1956. On September 7, 1956, four teaching Sisters of St. Joseph arrived to staff the School. Three days later School was officially opened under the patronage of St. Jude with an enrollment of 100 students, grade 1 through 4. An addition of a Kindergarten class happened on October 10, 1956, with Irene Pilarski as its first teacher. She held this position till retirement in 1990. The Rectory on Hildebrand Street was converted into a Convent to provide a residence for the Sisters staffing the School. The growing Parish soon needed additional brick and mortar. In 1960, the present Church was added. By dedication time, a year later, the gymnasium, the Marian and Keller Rooms (for social functions), were completed. In 1976 the Church was refurbished and during the winter of 1977-78 the Rectory was remodeled. In 1980 the Kindergarten and Community Room were added. In the intervening years since the founding of the Parish, several Pastors exercised pastoral leadership: Fr. John Szot, Fr. Raymond Balzer, Fr. Edward Narcowich, Fr. Henry Mascotte, Fr. James Stoyle and Fr. Derrick Sneyd. Together with these pastors, the Parish was also privileged to have the pastoral care of several priests who served as Associates. Their names are many, their duration of stay varied. The present Pastor is Fr. John Delaney who joined the parish in July 2006. On January 28, 2007, St. Mary of the Assumption Parish was merged with St. Jude. St. Jude offered to welcome St. Mary's members with open arms, of whom, many are still with us today. This opened up a new period in our parish history as both lifelong and more recent parish families continued to express a strong desire to see major improvements to the St. Jude School and Church campus. This began with several years of studying and planning, under the direction of Fr. Delaney. At once point a search committee even went so far as to research options for a possible new church under the name St. Catherine of Siena, that would have represented a joining of St. Jude and Sacred Heart of Jesus Parish in Lakeville. Even though this was an uncertain time in which strongly differing opinions about the future of the church held sway, our study group presented its findings to newly appointed Bishop Kevin C. Rhoades for review. The committee's recommendations and came back with the mandate to "make St. Jude as strong as it can possibly be at its present site." Thus began the work of planning which began as early as Fall 2011 with a site audit, in which architects and engineers details numerous improvements necessary to keep the St. Jude campus up to 21st century standards for safety, learning, and worship. This lead to an extensive in-parish survey in the winter of 2012 followed by a $3.5 million parishwide capital campaign known as "Our Time to Build" that kicked-off in the fall of that same year. Within 2 months of the campaign's opening, the parish had already received more than $2.9 million in pledges and planning commenced in earnest to break ground and get the project started. Completed between March and October of 2013, the building campaign saw major renovations to the church--including new flooring, lighting, pews, stained glass windows, furnishings, bell tower, and the addition of a narthex (gathering space). The school and church benefited from the addition of an elevator and the construction of two new classrooms, conference room, and combined school/parish office space. A great deal of time and funding went into improving the external grading of the site, including the purchase and demolition of a home that had been greatly impeding the front view of the property, as well as extensive expansion and modernization of the building's security and HVAC systems. That brings up to the present day where the St. Jude parishioners take enormous pride in what they have accomplished as well as the hope that they will quickly find a way to pay off the remainder of the building debt. There is much interest and discussion about the tantalizing possibility of adding a multi-use facility that would include social, fine arts, and athletic potential, as well as continuing renovations to the original school classrooms. Will St. Jude faithful have what it takes to complete the work of three prior generations? Time will tell, but if history is a good indication, the answer will be "yes" when the time is right.